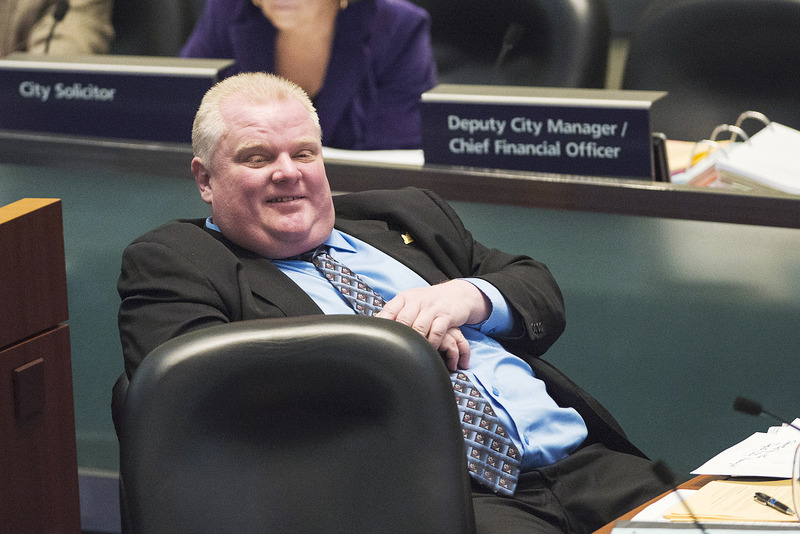 Rob Ford On 'Jimmy Kimmel Live' Was A Train Wreck, But What Did You Expect? Even Jimmy Kimmel said it was a bad idea for Rob Ford to appear on Jimmy Kimmel Live. But Toronto's crack-smoking, accident-prone, cringeworthy puppet of a mayor didn't listen. After Kimmel called Ford personally to ask him to appear on his show — bit of a one-eighty there, Kimmel — Ford agreed, and made his debut Monday night. Spoiler alert: It didn't go well. Ford's brother, Doug, told the Toronto Sun that Ford was a "little upset" after the taping, and the paper claimed Ford was heard complaining that he was "set up." The jokes started innocently enough. Kimmel's first question to Ford was: "Why are you dressed like a magician?" But throughout the show, Kimmel pummeled Ford about his weight, exercise routine, and clumsiness. Kimmel didn't even have to make jokes; at one point, he simply showed now-viral videos of Ford in quick succession, including one of Ford stumbling backwards before throwing a football and one of him cursing and slurring in a Jamaican accent. Kimmel's ridicule is not unmerited. After all, this is a mayor who has admitted to smoking crack while in a drunken stupor — direct quote — and was stripped of nearly all of his mayoral responsibilities after flat-out refusing to step down. Still, during the interview, I started to feel a little bad for the mayor, who was apparently sweating so much that Kimmel had to wipe his brow with a tissue. And Kimmel's barrage was met with a generally decent attitude from Ford: When Kimmel read Facebook comments from Canadians complaining that Ford made Toronto look bad and that he's guilty of "domestic abuse, drunk driving, racism, homophobia and inability to tell the truth," Ford responded, "Is that all I got?" Ford maintained that he appeared on Jimmy Kimmel Live to promote his city. He invited tourists to visit Toronto — which, in fairness, is no longer run by Rob Ford — and insisted that he's saved taxpayer money and accomplished "90 percent" of what he set out to do. Ford is running for re-election on Oct. 27, and believe it or not, he might not lose. Ford went as far as to say he wanted the infamous video of himself smoking crack cocaine to be released, since the Toronto police insist on wasting funds by following him around everywhere. "I'm a businessman, Jimmy," he explained. "I run [the city] like a business. No nonsense." NO NONSENSE. Excuse me while I go laugh until I cry. On a more serious note, Kimmel urged Ford to seek help if he is an alcoholic or drug abuser. Ford heartily laughed off Kimmel's insinuation that he is dependent on alcohol, claiming that he's just an average, hardworking politician. "I wasn't elected to be perfect, Jimmy. I was elected to clean up the mess I inherited, and that's exactly what I've done." Ford even invited Kimmel to appear on his own YouTube series, Ford Nation. But after putting up with Kimmel's criticisms for a good 15 minutes, he might want to rethink that offer. Ford, for his part, insists the interview was "no big deal."